Disclosure: This post has been sponsored by Walmart. Labor Day is right around the corner. That means that many of us are making plans to take the day off to enjoy that time with family and friends. Whether you are planning on hosting your own BBQ or you just want to spruce up your front door, today I will be sharing with you all an easy craft that one can do in just a few hours using one of my favorite materials…burlap. Like chalkboard paint, I’ve really enjoyed figuring out different ways to use burlap. Each time I go into Walmart with a craft idea in mind, I end up changing it once I see all of the new craft materials they have in stock. I was asked to share a craft with all of you for Labor Day and as I went into my local store I knew I wanted to do a wreath with a red, white, and blue theme. Wreaths, to me, are the easiest way to spruce up a front door. They instantly make your outdoor living space feel like a holiday. I was blown away by the many different varieties of burlap ribbon offered at Walmart from plain to patterned. And I was thrilled to see that my local store finally got some wire wreath forms in for just $2.77 for the 18 inch size. After perusing the craft aisles for a bit, I finally settled on my wreath idea. 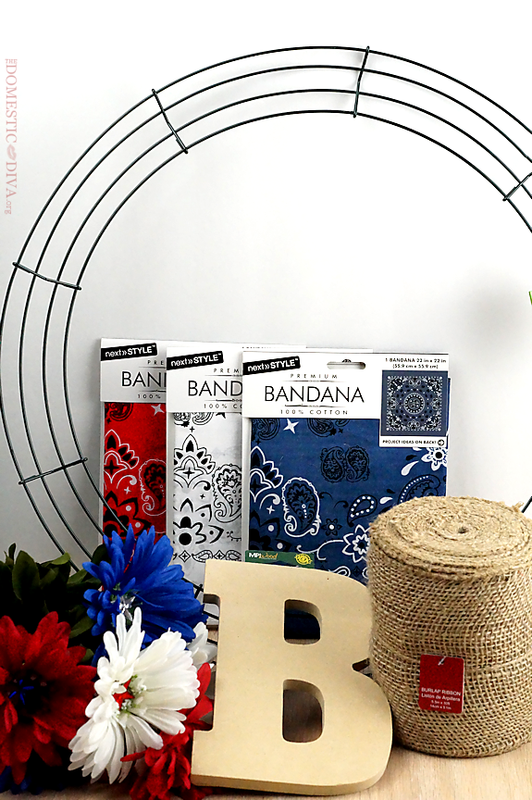 Below are the supplies that I picked up to make my Patriotic Burlap Wreath. A burlap wreath using a wire form is nothing more than a bunch of loops. It’s really quite easy once you get started. What I did was I placed the end of the burlap ribbon onto my craft table. Then making sure I have enough tail sticking out from the top of my wreath I pulled one loop up through the first open section of the wreath form between the first and second wires. I then pulled a second loop through the second and third wires. I repeated this action one more time until I had 3 loops in my first row. To start the second row, instead of pulling a loop directly next to the last loop that we made on the inside of our wreath, I skipped this section and pulled a loop through the second opening. There are only two loops on the second row. When I finish pulling loops up through the last opening on the outside of our wire wreath from I repeated the same thing we did to start the second row only reversed going into the center of our wreath. I continued this alternate action of two loops per row all the way around the wreath form. I had approximately 3 rows of loops per section on the wreath form. There really is no right or wrong way to do a burlap wreath. Twist and turn your ribbon however you would like so long as you are making that “looping action” until all of the ribbon is weaved and looped around your wire wreath form. The last section on the wire wreath form only had a few loops added to it until I ran out of ribbon, this is fine because this is where our initial letter will be tied to our wreath at. The important thing to note here is to make sure that your intial letter and remaining burlap ribbon covers as much of the wire wreath form as possible. To secure the burlap ribbon to our wire wreath form, I threaded some floral wire through the end of the burlap ribbon, both where I started and where I finished and tied it to the wreath form. To add details to our plain burlap wreath, I first spray painted an initial letter for our family with silver spray paint like I did for our Chalkboard Initial Memo Board. When the spray paint had dried, on the back of the initial letter I stapled some floral wire to give it something to grab onto our wreath with. I secured our initial to our wreath by twisting the floral wire around the outside wires on our wire wreath form both on the inside and outside of the wreath. Next, I took the flowers off of their stems and hot glued them next to our initial directly onto the burlap. To give our dull burlap a bit more color, I took a red, white, and a blue bandana from the craft section at Walmart and cut it the in half. Each half I cut into 1 inch wide strips. I randomly tied these strips to the wires between our burlap loops in a random pattern until I felt like it had enough color. 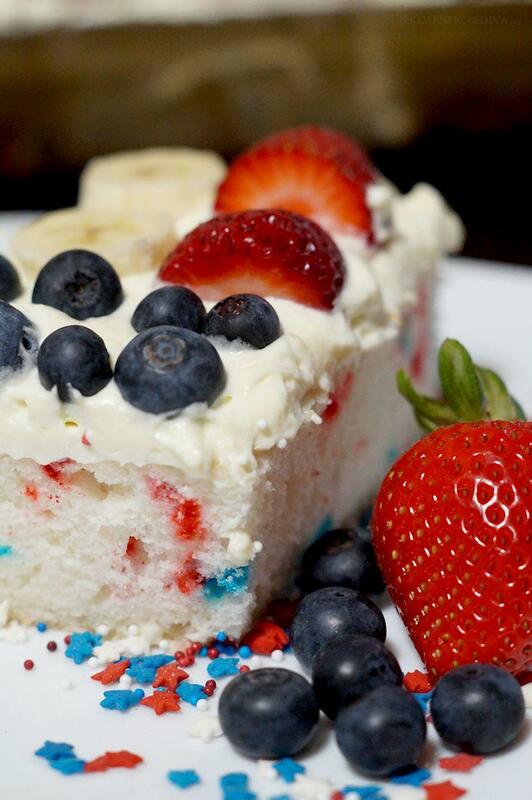 Complete your patriotic festivities with this incredibly easy to make flag cake. Perfect for Fourth of July, Labor Day, Memorial Day, or any event you want to celebrate. 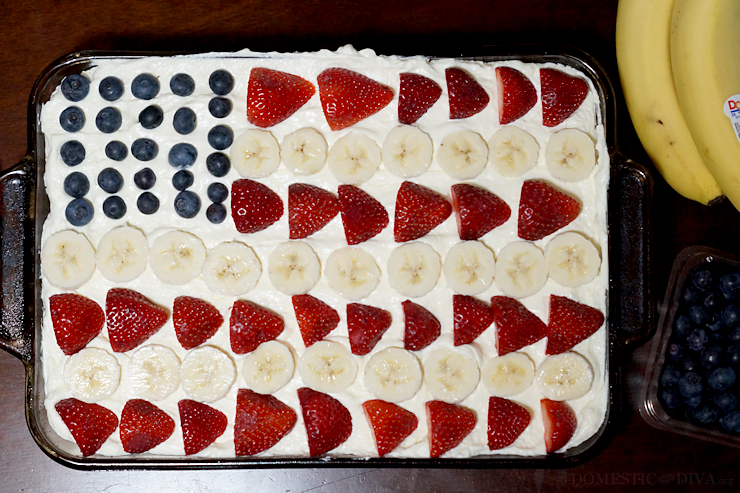 Get the recipe for this Patriotic Flag Dessert. This shortcake recipe is made in a sheet pan with plenty of strawberries, bananas, and blueberries that is sure to feed a crowd at your next gathering. Disclosure: As a participant in the Walmart Moms Program, I've been compensated for my time and efforts in creating this post. All thoughts and opinions are my own. My experience may differ from your own. This is so cute! And I love that you can change it with the seasons since the bandana strips are just tied on. This is such a pretty idea, Heather! I love how it turned out! …………awesome idea! You’re soooo crafty and talented!